After a lowercase L dry spell which left me doubting my own conspiracy theory, I finally return with fresh evidence, proof that an epidemic more eminent than the Avian Flu is upon us. Only this latest find is bittersweet victory. 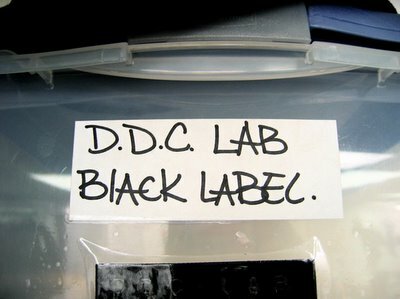 My client, DDC Lab, makers of the coolest jeans on the planet, are a team of wonderfully creative and admirable people. They run a highly effective business which has flourished in the years I've worked with them. After nearly eight years of loyal patronage, they are more than just a client, they are my friends. This is why I was baffled upon discovering their grisly BlACK LABEL bin. I am certain that no DDC staff member would have committed this offense, so it seems they have a mole in their midst. This is my third client to have lowered the case. I saw an AlL you can eat sign earlier this week. It was such a perfect specimin I almost cried when I remembered I have no digital camera. Anon, is the sign someplace where you can go back and snap a photo with a friend's camera? I hope so!